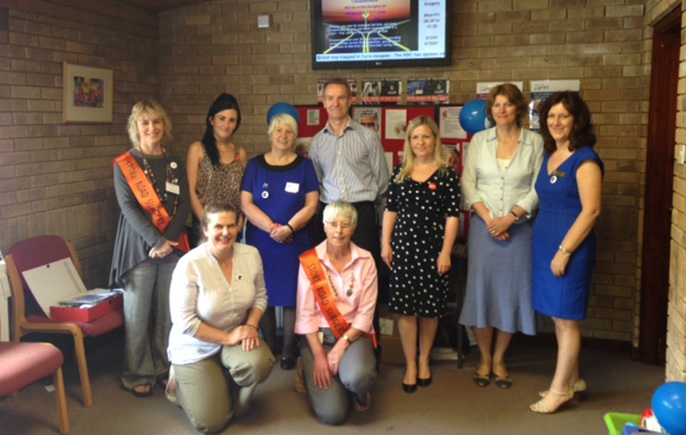 During Carers Week in June 2014, Crossroads Care teamed up with Stoke Roads Surgery in Bishops Cleeve, near Cheltenham, to raise awareness of carers and provide information on how they can be supported. Helen Baker had been introduced to Stoke Road surgery when she met Sue Green at a Carers Lead event organised by Gloucestershire County Council, an event that invites GP practices to hear about what carers services are available within the county. Sue has a dual role at the surgery as a Receptionist and Carers Lead. At a following meeting we discussed some of the ways that the surgery is identifying and supporting carers with GP appointments and signposting. The Surgery learned about how Crossroads Care supports carers and we agreed to work together during Carers Week. Stoke Road surgery invited Crossroads to have an information stand within the waiting room at the surgery for a whole day to provide information to patients who are carers registered with the surgery about being a carer and how we can support them with our services. Guideposts Trust also attended to give information on the Carers Emergency Scheme. The day went extremely well with lots of people enquiring and it was a great opportunity to come together for this cause. Stoke Road Surgery and Crossroads hope to plan more events together in the future.